Your dog is your best buddy. He is like family, which means you need to do everything you can to take care of his health. Well, there is no question there are plenty of aspects of effective dog health care, ensuring that his skin is healthy and devoid of lesions and infectious scratches are among the more important ones. Dog skin care is all about ensuring your canine companion does not develop skin allergies and other problems. Moreover, the healthier his coat is, the lesser the chances of parasitic infections and lesions. On top of that, if someone were to ask you how you would define a healthy dog, your answer would be to say that he has to have a healthy coat. A healthy coat means his skin is clean and does not have any fleas or infections. This can be due to excellent grooming practices and the quality of ﻿food﻿ he is being given. This is what a majority of dog owners say, and it is a truism. Nevertheless, before understanding everything that you can do to ensure he has a perfectly healthy skin, you have to first understand all the common causes and signs of dog skin issues. Dogs are like the human in a lot of ways. And just like us, a dog’s skin health can be affected by what he eats and your grooming activities. A good diet coupled with frequent hair and skin care can a go a long way in improving his chances of living a long and healthy life. It doesn’t matter what age your dog is, the fact of the matter is it is your responsibility to make sure you help him prevent skin allergies and associated problems and to help him combat serious symptoms even if he develops a certain disease. Look out for the symptoms and trace it back to the cause. If you see your dog continuously scratching himself, he might have a strong case of itchiness. This condition is also known as “pruritus”. 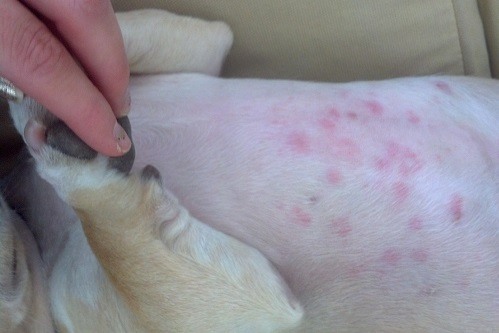 In fact, the canine itching has become one of the most primary causes for concerns among dog owners. Moreover, approximately 40% of dog owners who go to the vet complain of their dogs having skin complications. Dogs suffering from itchy skin develop several other skin related problems that include lesions, bacterial infections as well as hair loss. 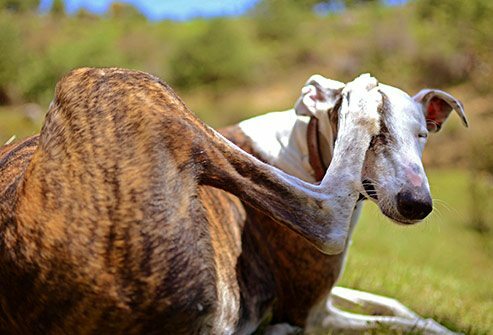 Have you ever thought about what makes a dog itch so much? 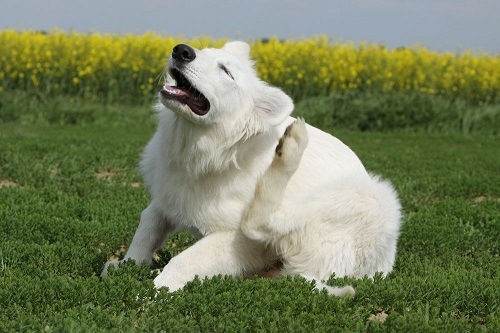 One of the most common reasons why dogs itch so much is allergies. This can further be categorized into three separate sections – food related allergies, environmental and flea allergies. There is no question flea bites can cause a tremendous amount of irritation and discomfort to dogs and their owners; it is important to realize that dogs infested with fleas quickly become hypersensitive. This means a single bite from a flea can be all it takes to causes an erratic reaction meaning your dog will start to scratch himself wildly. He will also begin to gnaw on his skin. This is why it is so important to take every measure necessary to rid your dog of fleas and prevent an outbreak. As long as you get rid of the fleas, the dog gets rid of itching and potential infection skin diseases. Use the best dog shampoo for dry skin to check for fleas and kill them off immediately. Dog skin irritation can also be caused by ﻿﻿environmental allergie﻿﻿s. Also known as atopy, it is a big problem. You may inhale different types of allergens like mite dander through either breathing or his skin. If this is the case, you need to give him an allergy shot immediately. Consult with your vet on the best course of action. Food allergies have become an even danger. Food allergies can lead to several dog skin issues. Dogs can become hypersensitive to certain foods; however, it is very difficult to determine what exactly they are allergic to. However, the treatment for food allergies is simple; feed him the best dog food for skin allergies. These dog food products are made with organically processed ingredients such as fresh, human grade meat. These foods contain a high concentration of powerful vitamins and minerals. Other factors that may cause dog skin issues can be a parasitic infestation, for example, fleas and mites as well as general bacterial infection as a result of constant scratching. In this case, your canine buddy can be highly susceptible to develop moist dermatitis or little red, hot spots on his skin. These can spread fast throughout his body, and it is important to have him evaluated as soon as possible. There are some different dog skin issues and irritation that you can recognize based on what your dog is doing when he is beginning to become symptomatic. 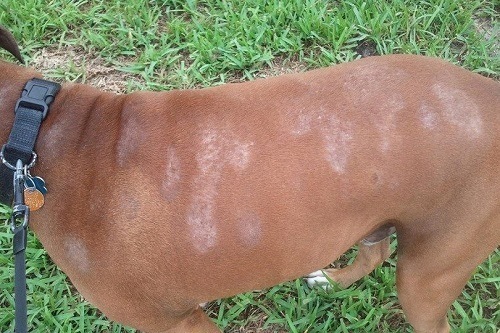 Although it is tough to pinpoint what skin problem he was suffering with, if you see the below-mentioned signs, immediately take your dog to the veterinarian. If you see even one of this symptoms or signs, take him for a thorough inspection. It is hoped that you find this comprehensive guideline useful and will implement the tips above to keep your dog healthy and free from dog skin issues.